First create a clear.gif file to use everywhere you want to stick lets say your logo. Dont worry about size the gif is but do wrap it in a div say we can control that clear.gif img properties. 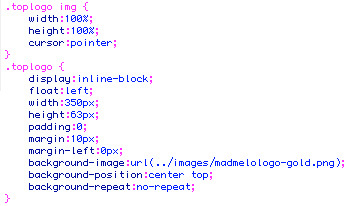 I then add that class to my CSS and make the img properties to be both 100% on width & height. Then create the class's properties to use the logo i want as the background of the div. after i got it right for current layout, i copy&paste for other sizes layouts and make the little tweaks needed with out ever having to touch the html embedded image. This saves time & coding for writing a script that swaps out each image depanding on page size. I hope you find this helpful. this sites breakdown to have development and design in separate tuts. They have free things to download for assets everyone and then n they got good articles. BASE kit for MOBILE web development: Pretty sick!